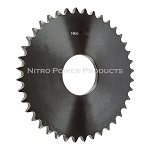 Weld on sprockets are a universal sprocket that allows you to build a finished bore sprocket from a wide range of bore sizes using our X series weld on hubs. Weld on sprockets can also be used as a Type A sprocket without a hub. We recommend using Low Hydrogen Electrodes for welding sprockets and hubs together.